Aikatsu Friends! – 027 | Mezashite! Ouch indeed, but it gives us a reason about that gaze Karen and Mirai gave them last ep. Yep, i know since the start that they would advise Mio, but well still hard to watch. We know from in-show conversations that the gradient in their hair is for TV-audience-benefit only. They both look exactly the same to the other folks in the show, since nobody can tell them apart outside of behavior/facial expressions. Hope that blue hair of Mio’s can help cool her off because that was one sick burn from Karen. It would be good to know how exactly the Diamond Friends Cup works… my guess is there are 3 spots open (aside from Love Me Tear, who gets in by default), and each spot is decided by some major event like the Brilliant Cup. If they want to make things more tense, they could have Pure Palette lose to Honey Cat for the next spot, plunging Mio further into despair, at which point AIne and Mio have their epiphany and manage to land the final spot. Well, they did call this Brilliant Cup the winter Brilliant Cup. That would leave an opening for the other seasons as wel. And was it even ever mentioned the Brilliant Cup was a hard requirement for qualification for the Diamond Cup? Al we know is that Love me Tear won it before they became Diamond friends, and for that reason it is seen as the gateway to succes. “The winners will earn a spot in this winter’s Diamond Friends Cup.” – 17:56. 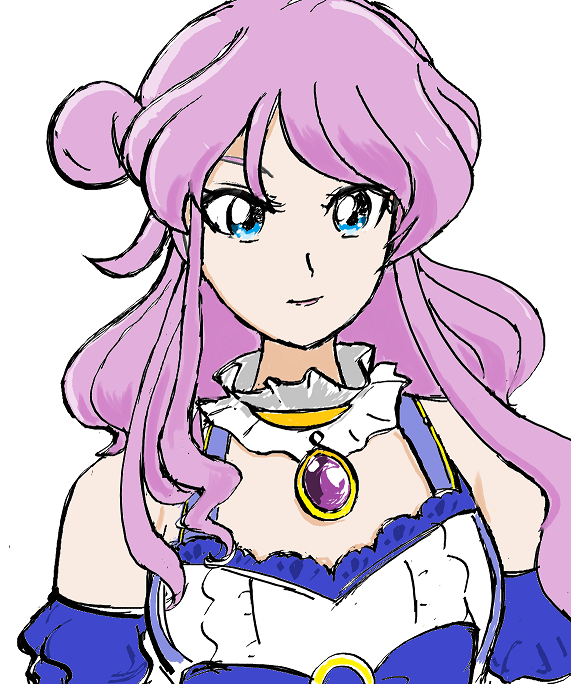 Do you even Aikatsu, bro? If this is a problem in the subs, neither I nor Etoce can find an issue with it. I think he was replying to my question in the previous post. It is, I don’t know why it showed up as a separate comment. Sorry about that. the twin episodes always seem to make me cry… I’m really enjoying the Mio plot, as well. It seems she’s falling back into her bad habit of being too self-reliant. My current prediction is that Aine will snap her out of it and they’ll learn how to use peak mental performance together, only to end up losing to Karen and Mirai in the Diamond Friends Cup, but I guess we’ll see! i’ve been on the fence almost every episode about these sisters, but these last two take the cake. i personally find this current arc to have the worst writing Aikatsu has ever had. for the first time in the entire franchise, there’s an entire subplot that i find laughably bad. I’m not hating—the anime as a whole is definitely not bad—but I’m honestly a bit jealous of anyone who is enjoying these episodes. I wish I could get into it and find their characters believable, but I just can’t. It’s all too over-the-top and overdramatic for my liking. The recent episodes involving the Shirayuri sisters heavily rely upon you caring or liking their characters, and to give some credit, that’s what their respective introductory episodes tried to make you do. But I’ve always found their characters and traits pretentious, irrational and generally obnoxious, and I was never actually sold on them before it started delving into the subplot for the two of them (side effect of the show having bad pacing). It getting even more serious before I’ve even warmed up to the characters is just making me dislike and roll my eyes at them more and more, and they’ve quickly gone from being potentially likeable characters to characters that will most likely never appeal to me. At one point I almost did start liking Kaguya, but then Sakuya was introduced, which put me back to square one. I almost feel like Sakuya doesn’t even deserve her own character because, other than caring for her sister, she has virtually no character of her own. They’re more or less carbon copies of one another, and I understand that they’re two halves of a whole, it feels to me like those two halves are actually just the result of splitting one character into two. In short: If you don’t like the Shirayuri sisters, this arc totally falls flat and is a bunch of meaningless nonsense, with the Mio drama thrown in as either an afterthought or something they don’t have time to give its own episodes to. Kind of disappointing and I’m hoping it’ll turn it around. I have a strange feeling about the twins. So far, their entire character development, whether it was sufficiently fleshed out or not (opinions will vary on that), was all about each other. There is no indication that they give a crap about anyone else. I wouldn’t mind too much, but I see some parallels with Ema and Maika. In their case it ultimately turned into a plot point – their inability to reach out to the outside led to their defeat. Now, I like Ema and Maika because they complement each other well without being complete opposites (yeah, I know one earlier episode suggested they are, but it really doesn’t look like that in their other appearances), and I do think their defeat was a bit forced. But in this new context, it begs the question of how, if connecting with your fans is so important, the Moon Twins were able to win even though they seem unable to look beyond each other’s existence. Maybe you could chalk it up to them being so incredibly good at idol activities that it doesn’t matter (even though Kaguya herself admitted to being mediocre in most things, and she started aikatsu’ing even later than Aine). Or maybe their manager is so good that they can focus on practice and he takes care of everything else. Either way, it feels like they introduced an aesop in the last arc, and now they just ignored it. I’d like to respond to your points, as it looks like there are two main ones you’re making: that you’re not a fan of the Shirayuri plots, and that Mio’s issues were not given sufficient spotlight during the relevant episodes. I’ll start from the beginning. In Sakuya’s very first appearance (and you had their names backwards, an understandable mistake), her first line is something like “you can never truly know another person’s heart, for it is like the dark side of the moon.” That immediately caught my interest and intrigued me, as it seems to run counter to the themes of Friends. So far it’s played out as more a general theme that underlies the interpersonal conflicts that each Friends must face, but has also served as a tiny bit of foreshadowing for their flashbacks later on. We then get to know more about Sakuya during the movie audition she attends. 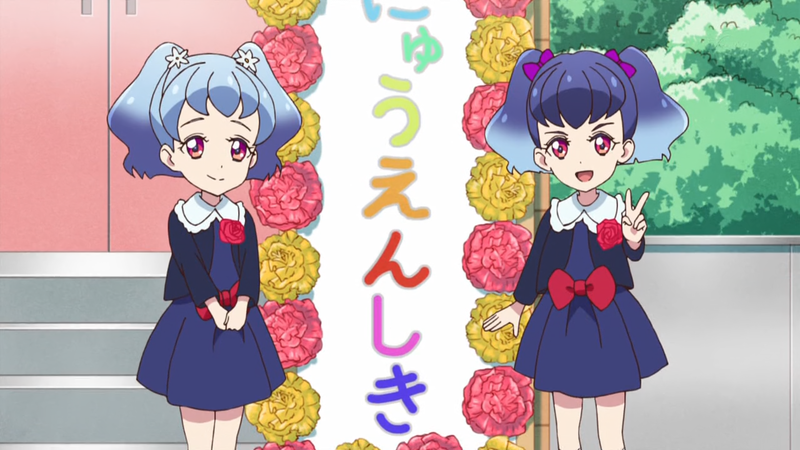 Although it’s easy to classify her in the tradition of Aikatsu loli gothic characters, a line is drawn between her and Sumire immediately. Sumire’s specialty was positive reading, taking the best interpretation of any situation. In contrast, Sakuya adheres religiously to her divinations, a point about her personality underscored by how the idea to be “from the moon” was originally Kaguya’s idea, both serving to show that Sakuya has a tendency to accept whatever is put upon her shoulders. Kaguya’s first appearance is literally as a shadow of Sakuya, and there are both obvious and more subtle points to expand upon that. The clear one right away is in her total inability to make divinations using her crystal ball, naturally the opposite of Sakuya’s 100% accuracy rate. But then there is the strange case of automatic motion detectors repeatedly not seeing her. Why is this? I think it’s because of her lifelong devotion to staying as the unseen half of Sakuya. She is deliberately making herself invisible, the dark side of Sakuya’s full moon. After all, the “light side” and dark side still make one total moon, right? But that’s not what Sakuya (or even Kaguya) want. We reach the episode where Sakuya decides to form Friends with Kaguya, who repeatedly refuses. By itself, this episode seems like your standard fare for a children’s show plot; two people will obviously get together, but there needs to be some drama leading up to it. However, that’s simply because it’s planting the seeds for the real reveal that is yet to come. There’s more inbetween my main points, like how I love the teams of idols splitting between Karen and Mirai, but I’ll gloss over that part to get to what really matters. At last, we reach the Brilliant Friends Cup. I’ll point out upfront that these two episodes were both written by the same person, so they were really meant to be taken together rather than apart, but episode 26 served as a sort of double cliffhanger for the purposes of dramatic tension. Now then: the twin flashbacks were some of the best examples of delicate writing I’ve seen so far. Let me explain what I mean by that somewhat odd term. Up until this point, we have had to simply accept that Sakuya was the good one and Kaguya needed to be convinced to become an idol and join. But here, in the telling of a single event, everything is woven together. Sakuya’s reaction to her divination of a misfortune seemed overblown to me. That is, until we learn that it is almost word for word identical to a previous divination she made as a child that actually came true. It cements her belief in her divination ability and her adherence to it, while at the same time turning the sisters’ relationship on its head. While Sakuya up to this point has appeared to be the leader (being the Onee-sama and all), it is she who can’t do anything without Kaguya. From her perspective, that event was about realizing her dependence on her sister. But then, and this is the most critical point, we see the exact same event from Kaguya’s view, and it couldn’t be more different. Her feelings of inadequacy as a child prevented her from seeing or accepting Sakuya’s love, and as she herself admits in one of the most emotionally piercing moments of the season, she even hated her sister. When she remembers the event, there’s no mention at all about the divination–simply the fact that her own foolishness, pride, and insecurity led to her getting lost and sick, only to discover that the sister she rejected loves her unconditionally, despite her flaws. In turn, this provides retroactive justification for Kaguya’s initial hesitance to become an idol. But defining a moment as this was for both of them, it also sets up a wall to be broken down together. Sakuya, who learns that her divinations can be overcome. Kaguya, who learns that neither support from behind nor self-sacrifice is enough. Although they had been back to back as the light and dark sides of the moon up until now, they then stand side by side, each being one half of the light and one half of the dark, together creating the brilliance of the full moon. This is why their hair is not totally light and dark, but reverse gradients of one another. That is why I believe the slow setup leading to the climax of their Brilliant Friends Cup victory was well done. Now I just want to briefly address your points about Mio. Rather than being done all at once in a “focus episode” (a term which I dislike), the slow burn of her descent into failure provides for much more tension and anticipation. Without getting too much into the details we all know, Mio discovering the zone on her own is significant, along with the timing of her feeling inadequate at her perceived lack of growth. According to my own research, getting into a flow state is indeed a good way to break past a learning plateau, but also as I said, it can lead to overconfidence. Personally I was surprised that the conclusion was Mio not actually being in the zone during the Cup, but the emotions behind why she failed were well within my expectations. Either way, I happen to like the method of storytelling that sprinkles small breadcrumbs leading up to a huge development just as much as I do highly focused episodes like 23 with the Bird Girl Fest. They’re just different but equally enjoyable techniques. So no, I disagree that her rise and fall were done without care. Also, the least good writing of Aikatsu was the forced ties in S2 of OG. Just have them trade wins, it’s not hard. I personally find the twins pretty fascinating because their personalities are the opposite of what you’d typically expect. You have Sakuya, who is soft-spoken and almost painfully shy, Kaguya who is much more confident and extroverted. But when it comes to stage performances, their personalities suddenly flip: Sakuya is really confident in her abilities, where Kaguya constantly feels like she isn’t good enough and is trapped in her sister’s shadow. Another thing that’s interesting to me is that where Kaguya claims she doesn’t have much talent, she actually does–it’s just a very different kind than her sister’s. Sakuya has natural intuition, which you see in her divination, but Kaguya, lacking that, has to rely on her creativity. She might not be able to do proper readings herself, but you also see her doing her research and tailoring her cold reading to what she already knows, and the result is more effective than she realizes. There might not be anything ~spiritual~ in her advice, but she’s still doing exactly what divination is supposed to: offer another viewpoint to the problem.